Skipper Marc Richards admits it will be ‘amazing’ when the Cobblers finally seal promotion from Sky Bet League Two. Town have a chance to do just that this weekend when they host Notts County at Sixfields, with Chris Wilder’s men needing to win and then hope Accrington lose to Cambridge and Bristol Rovers fail to beat Crawley Town. Richards has plenty of promotion experience on his CV, having achieved it with Chesterfield and Barnsley in the past, and he is looking forward to celebrating going up as a Northampton player. Asked about how he feels being so close to promotion, and claiming the league two title, Richards said: “It is what you work for all season, and it is what every footballer works for at each club. “Whether you are at Manchester United, whether you are at Arsenal, Chelsea or Wycombe Wanderers, it makes no odds. “We are where we are for a reason and we all work hard for each other and for the club, but it’s not just about us. “It’s about the fans as well, it’s about everybody who works for the club behind the scenes, it’s about the media who come down every week and interview the lads. 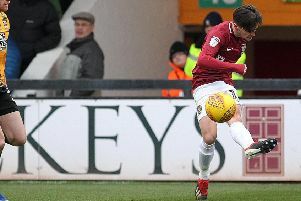 The atmosphere has been great at Sixfields virtually all season, and it is set to go up a notch this weekend with up to almost 2,000 extra fans set to pack out the reopened east stand. Along with the likes of Zander Diamond and John Marquis, Richards is one of only a handful of current Cobblers players that have experienced playing at Sixfields with four stands packed with supporters, and he is looking forward to enjoying it again this weekend. “I was here 10 years ago and involved in the play-offs over two seasons, and to see a packed-out Sixfields was amazing,” said the 18-goal top scorer. “The atmosphere was electric, and hopefully we will get the same again. Like all of his Cobblers team-mates, Richards is desperate to seal promotion as quickly as possible, but he knows this weekend’s clash with County is going to be a tricky one. “It is going to be a tough game on Saturday as Notts County are no mugs as they have been in and around higher leagues in the past few seasons,” said Richards. “At the moment they are not on top form, but you could say that about ourselves. “We are not playing pretty football, but we are grinding out results despite not playing like we have all season. Richards will be hoping he gets the nod to play his second match since returning from six weeks out with an Achilles strain. The 18-goal top scorer started at Mansfield Town on Monday, but was taken off at half-time as Wilder changed things around with the team trailing 2-0. It proved to be the right call as Town fought back to draw 2-2, and Richards admitted he was frustrated, but accepted the decision. “It was frustrating, but I don’t think it was the right type of game for me to come back into, but the gaffer wanted to get me on the pitch at some point,” said Richards. “I totally understand why he made the changes that he made, and it is just one of those things.